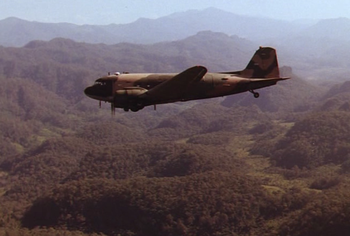 Douglas C-47 Skytrain used in Air America. The Douglas C-47 Skytrain is the military derivative of the extremely popular Douglas DC-3 airliner. It is also known as the Dakota in British military service. The C-47 differed from the civilian DC-3 in numerous modifications, including being fitted with a cargo door and a strengthened floor. During World War II, the armed forces of many countries used the C-47 and modified DC-3s for the transport of troops, cargo, and wounded. The U.S. Naval designation was R4D. More than 10,000 aircraft were produced in Long Beach and Santa Monica, California and Oklahoma City, Oklahoma. Between March 1943 and August 1945 the Oklahoma City plant produced 5,354 C-47s. Please note that the licence built Soviet variant was a heavily rework plane which its own category as the Lisunov Li-2. This page lists all films that feature a variation of the Douglas C-47 Skytrain. For the civilian variant, see Douglas DC-3. Pages in category "Douglas C-47 Skytrain"
Riuscirà il nostro eroe a ritrovare il più grande diamante del mondo? This page was last modified on 27 January 2015, at 13:18.